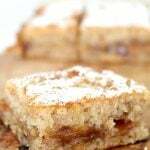 Treats are difficult to make when you need to go egg and dairy free but these banana blondies take care of those problems without sacrificing taste. 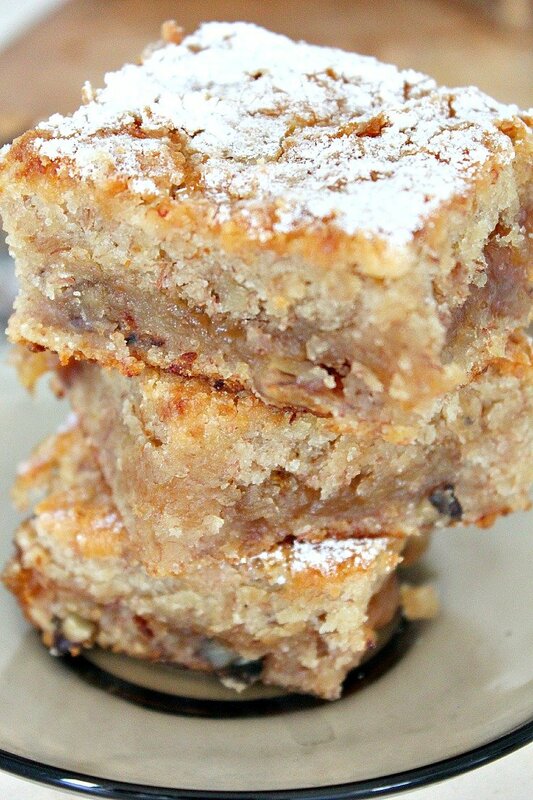 These vegan blondies are perfect for sharing at parties, picnics or as a sweet afternoon treat. Delicious with ice cream too! We hate throwing food, fruit and veggies in particular so instead of forcing myself to eat them while pulling all sort of funny faces, I decided to bake these yummy banana blondies. I don’t particularly go bananas for well…bananas lol but since I know they’re really good for your health, I keep bananas in the house all the time. As I try and make my daughter eat one every day, we normally go for the small or medium size ones that fit her tiny stomach. 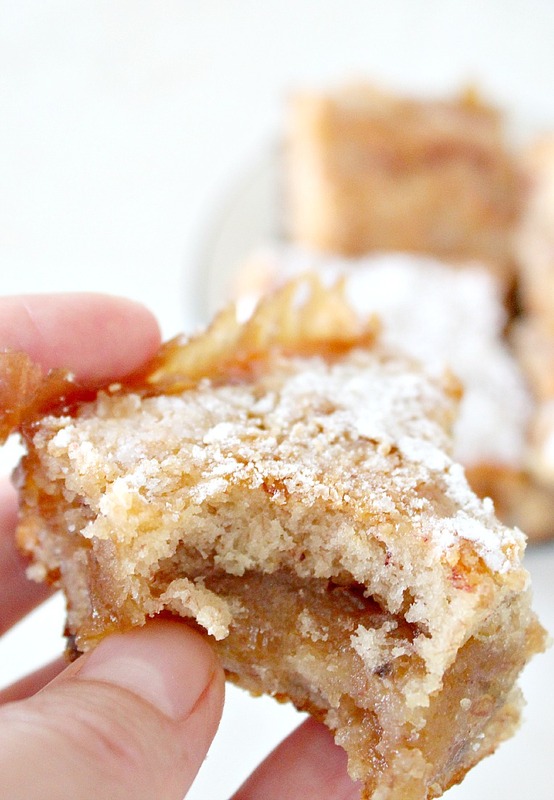 I was in the mood for something like brownies but I didn’t feel like eating anything chocolatey, so brownies were off the list until I realized there is this awesome, lighter version: the banana blondies! I also didn’t feel like putting butter or eggs and dairy in my banana blondies recipe so I thought I should give the coconut oil a try instead of butter and replaced the egg with an additional banana. I also used baking powder which I mixed with a little white vinegar, to make up for the lack of dairy and eggs and help my banana blondies get super fluffy and soft. It all worked like magic! And don’t worry, there was no trace of vinegar after the blondies baked. 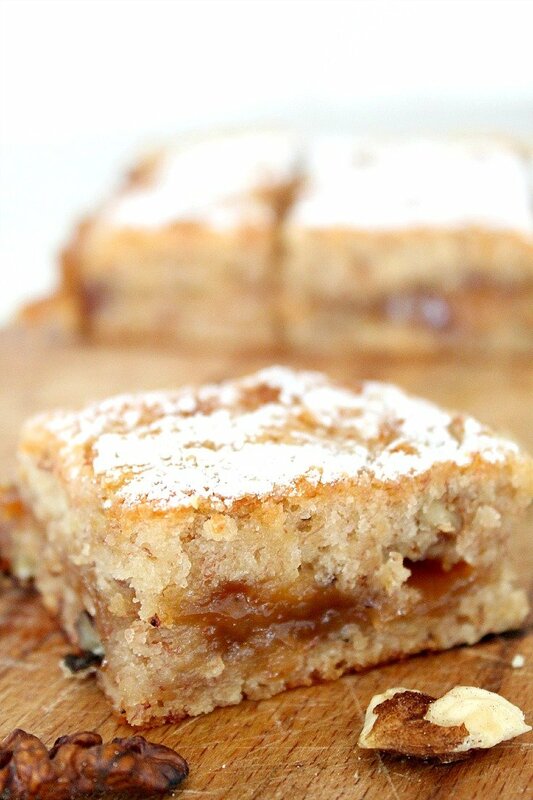 I loved how the caramel sauce in these vegan blondie brownies turned crispy on the edges, as it flows out a little during baking. 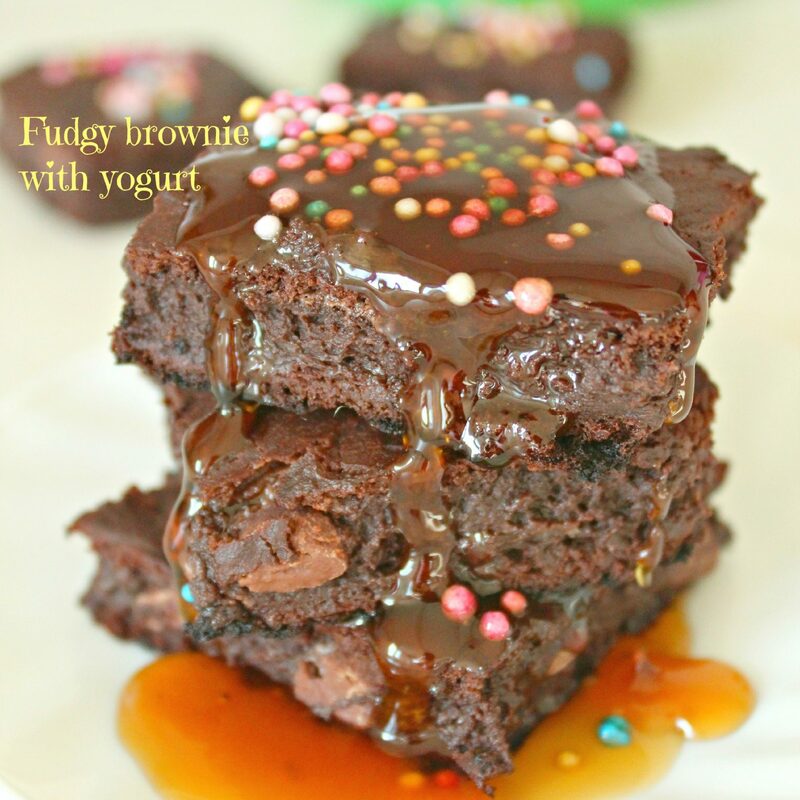 It helps create a great mixture of moist, crunchy and gooey in this amazing dessert. I also like the look of the top, created through sprinkling powdered sugar during the baking process; it gives a fake look of a crispy top when in fact it’s super moist. And the process also makes these vegan banana bars look quite elegant. 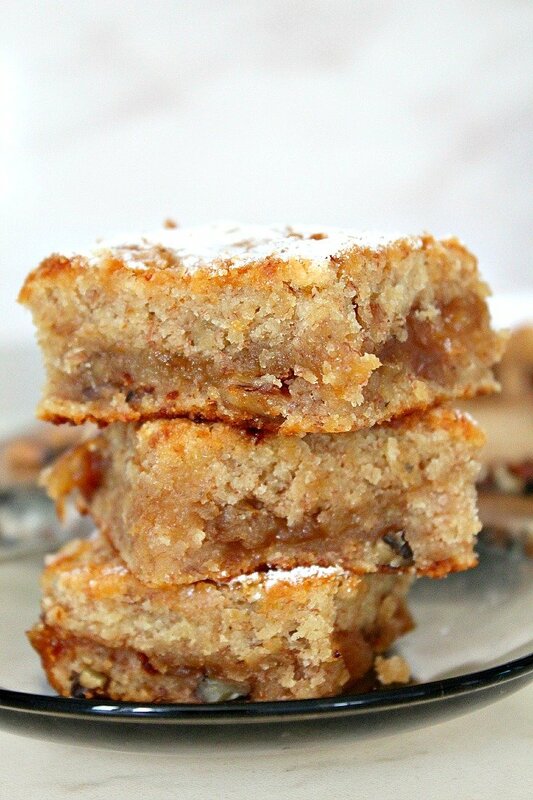 For those of us who have left over bananas, but hate that dry banana bread, these banana blondies are really moist and yummy! 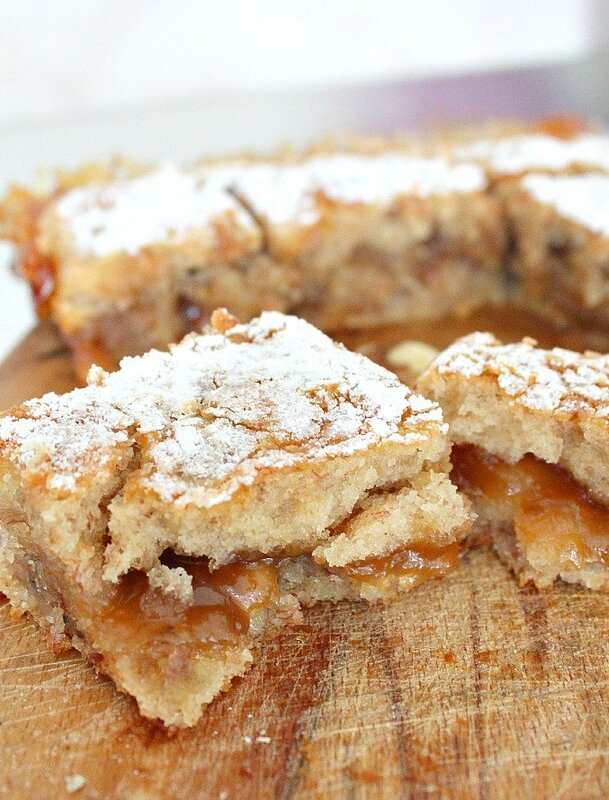 These vegan blondies are packed with banana, walnuts, coconut oil and rich caramel. They’re quick and easy to make, taking just minutes to prepare and are incredibly delicious even without eggs or dairy. I like to keep these in the fridge as they taste amazing cold from the fridge, especially at summer. Place the coconut sugar and water in a saucepan over medium heat. Stir until sugar is dissolved and let bubble for 2-3 minutes. Pour in the coconut milk and keep stirring until it has fully combined. Turn down the heat and allow the sauce to simmer for 10-15 minutes until thickens. Remove from heat, add vanilla extract and stir well. Pour the sauce into a bowl or jar and allow to cool. Beat coconut oil and sugar until fluffy or sugar has completely melted. Oh dear – I had a bit of a fail with these. It didn’t specify how much flour – just said 1 1/2. I presume that meant cups, because everything else was in cups. But there was so much flour the mix turned into a stiff dough. I loosened it with a bit of spare coconut milk but the resultant blondies were very dense and rubbery. Still tasted pretty good though! I’d like to have another go, so could you please tell me how much flour I should be using. Hi Anna. 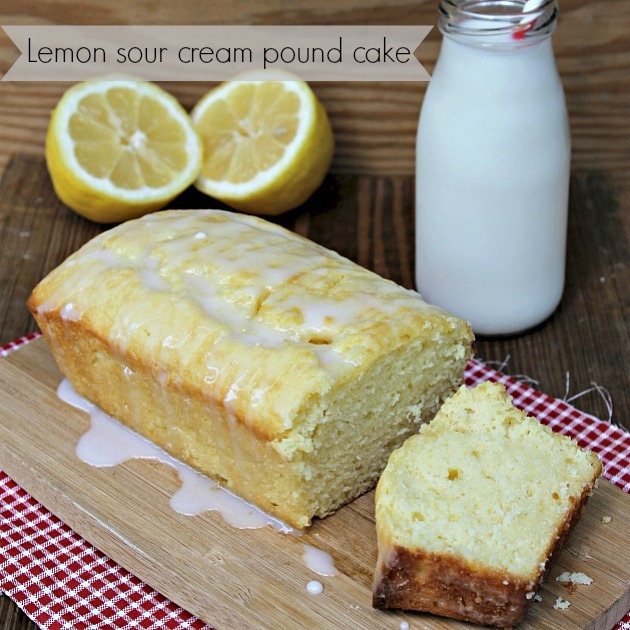 Thanks so much for loving this recipe enough to give it a try, it’s one of my most favorites! And I’m sorry you had some troubles making it. The measurement is indeed in cups, I used 1 1/2 cups. The difference between mine and yours might be in the quality of the flour and also in bananas (size and how ripped they are). Also, did you mix the baking powder and vinegar first? 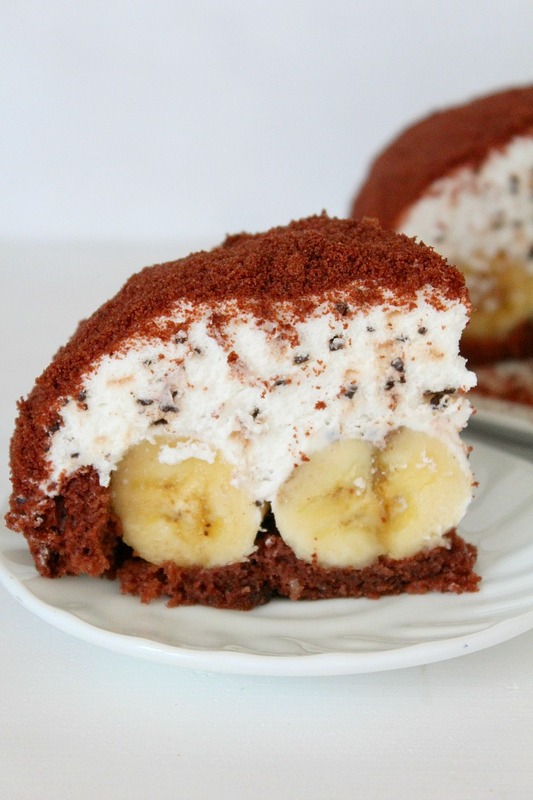 You can always add more banana if you think you need to make the batter thinner. Try sifting the flour first, if yours is too dense, it won’t fluff and so the batter will be thicker. I hope these help. Oh OK thanks – I did mix the baking powder and vinegar first. Perhaps my bananas weren’t ripe enough but I did mash them heaps. These look great! I’m not familiar with Coconut Sugar…. So for the caramel can I substitute for regular Caster Sugar, and if need be substitute the Coconut Milk for Almond or Soy Milk? Thanks in advance! Hi Jonathan. Thanks so much for stopping by and for your interest in my recipe. Coconut sugar looks like brown sugar but has a slight caramel taste. You can substitute for brown sugar if you can’t find any coconut sugar. I never tried Almond or Soy milk in the caramel recipe but if you must to, I would try almond as it’s less flavorful than soy (at least that’s what it seems to my taste buds). Hope that’s helpful. Please let me know how the sauce turned out, I’m intrigued about swapping the ingredients. These turned out perfect! The coconut caramel was perfect on its own.. haha! Thanks for the great recipe! Wow these look good!!! Pinning to make later! Yum! Aww, thanks so much Sandra. I’m sure yours will be much tastier than mine.